Depending on your budget and needs, we can craft a custom denture to fully restore your smile. Dentures are dental prosthetics designed to replace the visible portion of missing teeth. Using a full or partial denture, we are able to restore several consecutive teeth or an entire dental arch. 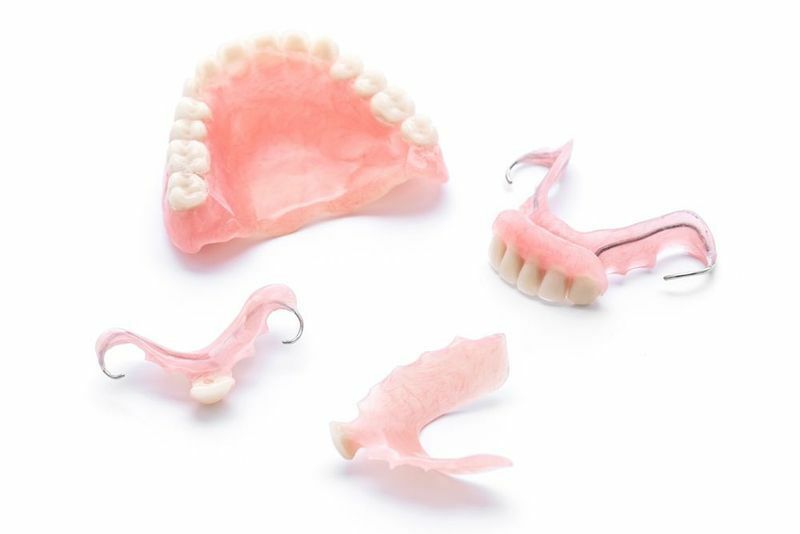 Our dentures can be crafted from porcelain or acrylic depending on your budget. Traditional dentures sit atop the gums and are held in place by a dental adhesive or clasps as well as natural suction. They are also removable. If you have suffered from substantial tooth loss, dentures can help you chew, speak, and eat more confidently. Implant-supported dentures are secured using dental implants which are surgically placed into the jawbone. In these cases, the restoration is affixed to the implant posts and is not removable. This provides patients with the peace of mind that their dentures are stable and will not slide around while they are eating or speaking. Additionally, the implant posts stimulate the jawbone, providing several oral health advantages. Considering the additional benefits of implant-supported restorations, we typically recommend this solution to our qualifying patients. If you have suffered from substantial tooth loss, dentures can help you chew, speak, and eat more confidently. Additionally, dentures can support your cheeks and lips for a more youthful appearance. During your consultation, we can evaluate your smile to determine whether traditional or implant-supported dentures are the best solution for your needs. We will take impressions and a mold of your bite which will be used to design your denture. We will then send the materials to a lab so they can create your prosthetic. You can preview your results by trying on your denture to see if you are happy with the way it looks and feels. You will receive your denture and can wear it home. During this time, you should make note of any issues that arise. We can make any necessary adjustments to create a denture that fits comfortably, functions properly, and looks natural. We pride ourselves on providing high-quality solutions and a pleasant patient experience. When planning your treatment, Dr. Caringal will take your priorities into consideration, including your budget and aesthetic preferences, for the best possible results. If your dentures have been damaged or are no longer fitting properly, you need a quick solution. We provide convenient, same-day repairs so you never need to go without a complete smile. While dentures are typically covered by insurance, implant-supported dentures are not. However, we accept financing through iFinance® Canada to help make treatment more affordable. Learn more about our denture options by contacting us online or calling us at (416) 646-1737. Dr. Caringal and our team are passionate about providing you with personalized care and high-quality results.